Matt at AidThoughts asked a few weeks ago why charities such as Oxfam don't push for increased immigration as a policy issue, given the obvious benefits, and the desire of many people to move (over a third of Sub-Saharan Africans would prefer to live elsewhere, permanently). "Why should we continue to condemn people to shoddy governments, bad climate, meager opportunities and endless experimentation at the hands of (us), the aid community? There's been a lot of talk recently about allowing the poor to have a greater say in the development agenda. Why not let them do the voting with their feet?" 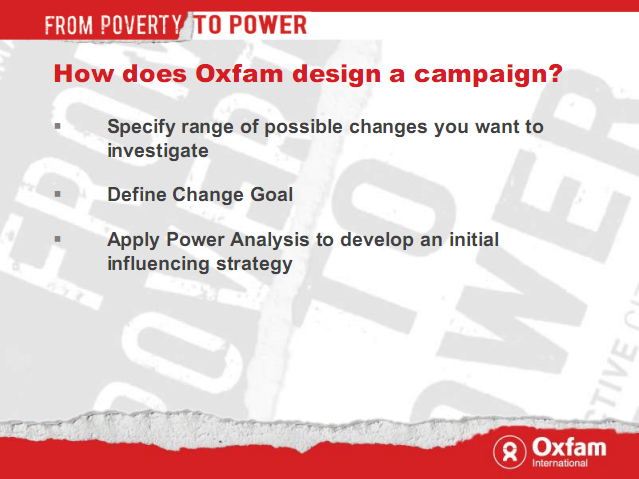 Duncan Green, head of research at Oxfam indirectly sheds some light on the question of Oxfam campaign choices in one of his introductory development lectures (kudos for sharing). Duncan is well aware of the importance of migration for development - he has blogged about it here and here. 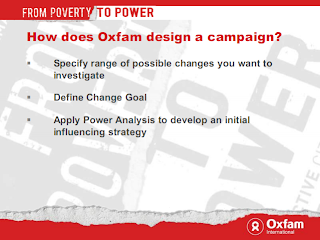 But when Oxfam comes to design a new campaign, it thinks strategically. It does some "Power Analysis" (political economy) and thinks about what is feasible and who needs to be targeted to effect change, and how. Seems to me that Oxfam just doesn't fancy taking on the 2 in 3 British voters who think that immigration is bad for Britain, and risking squandering some popularity and political capital. Migration is a lost cause. Why bother. Just like British voting rights for women was a lost cause. And the African-American civil rights movement. And apartheid in South Africa. Lost causes, all of them. Why bother. Stick to something easy like sponsoring children. Am I right Duncan? Where is your vision! Where is your ambition! Let's take on Global Apartheid and do something serious about poverty! well, to be fair, the 'lost causes' you cite include one which was supported by directly or indirectly 50% of the local population (though obviously not voters) and one which was supported by even more people. All also had campaigns of widespread civil disobedience or violence. There's nothing like the same level of support or fervour for migration policy. Which is not to say that it's not important, but simply that the comparison doesn't work. It's easy to criticise an NGO for not taking up migration rights, but it's a much more difficult issue because by definition it's appealing for the rights of people who are largely outside the sphere of experience of the targets of the campaign. Still, none of this is to say that they shouldn't even have a campaign about migration. Just that the campaign faces a completely different kind of challenge to the struggles for civil rights of *local populations* that were disenfranchised for immoral reasons. I think you have a pretty severe case of selection bias here. You chose 3 visionary campaigns that worked, but there are hundreds of cases where campaigners 'speak truth to power' and power takes absolutely no notice. Those campaigns disappear from history, and so don't appear on your list! And anyway, aren't ending world poverty and averting climate meltdown enough for you to be getting on with? Oh, and we don't sponsor children. Never have. Yeah OK, all 3 are bad examples. But they aren't really the point. The point is shouldn't it be worth having a go at something which looks hopeless if the potential up-side is so large? Is there any anti-poverty programme which comes close to the gains from migration? If so I'd like to hear it, and if not I want to know why Oxfam isn't shouting about migration. Sorry for the sponsoring jibe. That was childish.